The Twin Towers Alliance » Death to America? There is a sense of alienation building between the people of America and our self-appointed “betters” that could prove far more lethal to the American Dream than any foreign enemy. Our nationâ€™s uniquely inspiring narrative is only safe as long as we, the people, really believe it. But if we become demoralized and start to believe that government of the people, by the people, and for the people is a farce, if we lose faith in the social contract that has seen us through centuries of turbulence and challenge, it will be a watershed for America. The consequences will be swift and impossible to manage. And nowhere is the betrayal of everything we stand for more evident than at the World Trade Center site. A picture is worth at least a thousand words. Images register in places where words cannot penetrate. Symbols and icons are the international language. Since 9/11, most of us have known instinctively that the image of the Twin Towers crumbling must be reversed and our world-famous skyline restored. That should have been enough to mandate it — especially since the World Trade Center is publicly-owned and publicly-funded property. It would have been easy enough to accomplish, if only our own government had cooperated. But officials effectively embezzled billions of public dollars to defeat what the public wanted and to substitute what suited their own narrow interests instead — and the media gave them the cover they needed to do it. How much more degraded can they get? It would be bad enough if these “masters of the universe” were building something breathtaking and bold. But what is it they are giving us in place of a premier American icon? 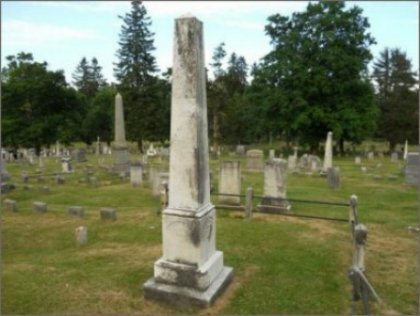 A tombstone — a giant version of the obelisks that are so prominently found in cemeteries all over the world. 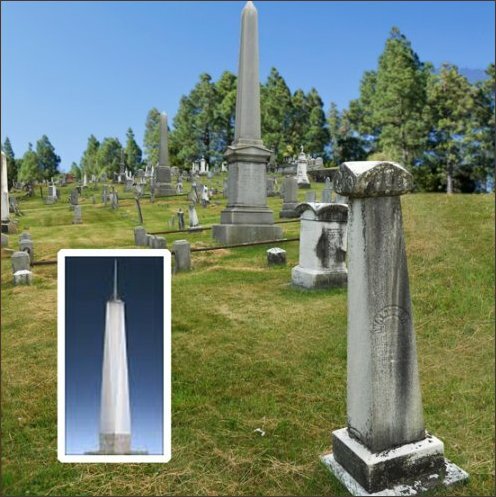 Without exaggeration, most Americans can walk into their nearest graveyard and see dozens of miniature Freedom Towers scattered around. So, thirty-one years after Americans turned on the evening news to the horrifying sight of a sea of Iranians chanting â€œDeath to America,â€ we are giving our enemies the visible satisfaction of having disfigured the skyline of New York. We’re even putting up the tombstone for them. It was recently reported that the employees of CondÃ© Nast are strongly opposed to the possibility of moving their operations into One World Trade Center and think itâ€™s â€œcreepy.â€ No wonder. Imagine starting off the day by walking into the lobby of a windowless concrete tomb. The contrast to the sundrenched lobbies of the real World Trade Center is a metaphor for America that most of us refuse to accept. Then imagine having had to walk past an appallingly tasteless memorial to get there or looking out your office window at thousands of gallons of water disappearing down two giant drains, which is another eerily apt metaphor for what the 9/11 architects envision for our nation. After all, what will “the largest manmade falls in North America” convey, as the â€œwhite noiseâ€ of the thundering water inescapably mimics the roar of the crashing towers? That our country is being shaped by forces beyond our control and we are no longer in charge of our destiny. The awful fact is that may be true. We may actually be letting go of what is only rightfully ours to pass on to future generations. That is what the fight for the Twin Towers is all about. That’s why it’s not too late to do the right thing. Because if it gets to the point where it really is too late, there will be no do-overs for our country. The current project has been a continual series of do-overs for one reason — because officials shut the public out and willfully misled the American people, even though, as usual, we are the ones who are forced to finance their follies. The concrete bunker base of the Freedom Tower is a perfect example. It is the predictable result of having given the project to a “conceptual architect” who had never designed a skyscraper before, let alone a complex of them, and who blithely placed the tower in the most vulnerable location on the site, while those who knew better and should have spoken up oohed and aahed instead. Daniel Libeskind’s prior claim to fame is the Holocaust Museum in Berlin, and it is more than ironic, it is macabre, that in Israel the Twin Towers would have been rapidly restored as a matter of utmost urgency — on the footprints — because Hitler’s victims are victims no more and have made a science of how to resist being terrorized by a vicious enemy. It is hard to understand how so many major supporters of Israel — Bloomberg, Silverstein, Giuliani, Pataki, Silver, Spitzer — were willing to inflict something on the American people that Israelis would never tolerate. Israelis would never give their enemies a trophy to take credit for, while we are carelessly surrendering our incomparable skyline and our identity with it. Why is all of this happening? It’s simple. Democracy was short-circuited. Real dialogue had to be avoided at all costs from the beginning, because it was a given that if the people had a say the Towers would rise again. But for the anti-Towers agenda to succeed, the media had to be willing to go along — and that they did. Those who are meant to inform the people and protect society from self-serving politicians misinformed them instead on a massive scale, which continues today in full force. Ironically, â€œThe Elements of Journalism — What Newspeople Should Know and the Public Should Expectâ€ was first published in 2001, and if only its guidelines had been observed since then, we would be living in a dramatically different country today. Anyone who can look at what is happening at Ground Zero and get all jazzed up over the technology on display — instead of demanding to know why that technology isnâ€™t being installed in new Twin Towers — is a tool in the hands of those who are mocking our country. The danger of standing up too close to anything is the loss of perspective. Ground Zero should only be covered from across the harbor, with the Statue of Liberty in between to give it context. Then the disgrace of the current course becomes clear. The only legitimate question is “what do the people want?” Vibrant new Twin Towers (which could still be built in record time, if they cap off the Freedom Tower and forget about 4WTC) or a colossal tombstone rising beside twin stumps and gigantic drains? Port Authority Executive Director Christopher Ward, who is as much to blame for what is being forced on the public as George Pataki or Michael Bloomberg — except that he never took an oath of office — is in Europe trying to attract interest, but he just may find that the visceral CondÃ© Nast reaction to the â€œCreepy Tower” is going to stick — because it really is creepy. We have been slow to weigh in on the controversy, because of our non-profit status, but we must, because the same broken system that gave us the Freedom Tower is back in action. As we note at the top of our new foundation’s home page at www.twintowersalliance.org: “The ear of the leader must ring with the voices of the people.” We chose that Woodrow Wilson quote for our educational effort because respect for the democratic process is the antidote to all that is poisoning the bloodstream of our nation. There was a hearing in Lower Manhattan last week to consider the question of the â€œCordoba House.â€ What the event and the non-binding vote endorsing the mosque and community center made clear once again is that our democracy has been badly wounded and needs our urgent care. There are compelling questions being asked, but instead of answers we are fed slanted news accounts that reduce all the concerns to mindless bigotry and ignorance. The media’s power to distort and trivialize reality has become this country’s ultimate threat. Every one of us, particularly those whose loved ones paid the ultimate price for being Americans, deserve to know how the $100 million dollar project two blocks from what remains of the World Trade Center is going to be funded. As long as the funding is anonymous there is obviously a very real chance that the money could actually be coming from those whose funding made the 9/11 attacks possible. Why is that concern so hard to understand? And why on earth don’t we all share it? But if the Mayor can’t appreciate that the objections have little to do with religious freedom and a great deal to do with lax due-diligence, that is really scary. More illustrious Americans than Michael Bloomberg have recognized that the Constitution is not a suicide pact. Twenty-two years after those first “Death to America” chants, Americans were horrified again, this time by Middle Eastern crowds dancing in the streets, rejoicing while so much of the world mourned along with us. But most Americans do not ascribe that virulent hatred to a whole religion or the people who practice it. Opposition to â€œCordoba Houseâ€ is not opposition to its stated mission, or to the Islamic faith. The concern is due to its location, short blocks away from where generations of New Yorkers went to celebrate their highest high points and where collectively we suffered and are still suffering our lowest low point. If those behind the Cordoba Initiative — whoever they are — really want to advance understanding, they should explain why they chose this particular location and where their funding is coming from, or they will only exacerbate, not relieve, tensions and divisions. The way to defuse misunderstanding is with scrupulously clear answers, not evasion. Most Americans are all for cooperation and mutual understanding. Thatâ€™s what America stands for, that is what the Twin Towers stood for, and that is why they were destroyed, with thousands of innocent lives trapped inside. But sensitivity is a two-way street. Jefferson also said that “The will of the people is the only legitimate foundation of any government, and to protect its free expression should be our first object.” When powerful individuals can defeat sound challenges to their pet policies by deflecting questions and manipulating the media — when citizens canâ€™t get straight answers to straight questions — then democracy is wasting away and may soon be too weak to stand. WHAT THEN? Four years ago, in our first TTA Memorial Day message, we quoted President Theodore Roosevelt, who said â€œthere is only one quality worse than hardness of heart, and that is softness of head.â€ We owe it to those who were murdered on 9/11 not to be gullible fools. All that we have struggled to promote since 2006 has given us a priceless education on how this country works, and how it is breaking down. We do not believe it is too late to do the right thing, just because those we elected to serve us brazenly circumvented the democratic process. The mess they’ve made is their problem — it doesn’t have to be ours. The only thing that will remove the stigma of creepiness from the World Trade Center and give the footprints the context that the memorial deserves is spectacular new Twin Towers rising in our skyline — not some alien view. We can’t restore the lives that were lost, but we can return the lights of home to the skyline they knew and loved. Or we can continue to shrink in the face of our challenges and tiptoe past the graveyard of our future as we bow to the superior will of our enemies. We are convinced that this period is the century’s proving ground, on which either the â€œDeath to Americaâ€ wave will triumph or else a vibrant culture of life will flourish — and with it, the promise of a better world for all people of good will. Then we will finally have a fitting tribute to the lives that were sacrificed on September 11, 2001, and to all the sacrifice that has followed. The world today is eerily reminiscent of England in the 1930s, when those ‘in the know’ sneered at Winston Churchillâ€™s warnings and indulged in the most perverse wishful thinking. The refusal of those in control of the governments and the media on both sides of the Atlantic to face reality resulted in the deaths of 60 million people, as surely as if they had pulled the triggers, dropped the bombs, or built the concentration camps. Twenty thousand 9/11s. How much worse will be said of the mis-leaders of today, with such a terrible example to avoid.